Ceiling fans come in various diverse styles, finishes, and designs. Fans are made not only to function but also as decorative items, often times when selecting a ceiling fan appearance is just as important as other factors (quality, price, etc). Choosing a style of ceiling fan is no longer as simple as simply picking a color you like. Based on the setting and what decorative role the fan will play there are a variety of drastically different options. The first thing to determine is whether you want the fan as a significant part of the decor. 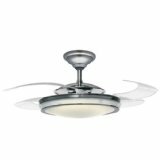 A plain white fan on a white ceiling will blend in, as will a dark wood fan on a wood (beamed) ceiling or any other fan color-matching it's surroundings. If this is the desired effect then you would chose a very simple fan design. In most cases, the fan is noticeable but fits in with the decor. This is done by matching or blending the fan with other furnishings and accessories in the room, not necessarily with the ceiling itself. For example a room with oak floors and brass hardware (light fixtures, doorknobs, etc) could have a brass fan with oak blades. A plain/simple/traditional style fan will fit in with just about any room, whereas a contemporary styled fan will fit better in a room with modern furnishings, an ornate/victorian styled fan will fit in better in a room with antique furnishings. This is more a matter of determining styles and finishes that fit, nothing has to match specifically. Viewing different fans and saying "I think that one will look nice in the bedroom" often works well enough! A final option is not only for the fan to be a part of the decor but the focal part of the decor. There are many fan designs that are very unique and distinctive, such as sailcloth blades, palm leaves, stained glass, propellor designs, etc. One of these fans is often the first thing you notice in a room. The other furnishings should be appropriate to the style of the fan otherwise the fan will look significantly out of place. Beyond that there are no real suggestions or guidelines, if you like a certain style of fan, but realize how noticeable it may be. If a fan with a light kit is required, it may also fit into the same categories. A light may simply be functional and fit in with the style, or it may serve as an elegant chandelier or a modern art piece. The light should not only fit in with the decor of the room but also with the style of the fan, that is why many fans include light kits. This encompasses all styles of fans as modeled after original designs. Early ceiling fans were made to be functional, not pretty, and therefore are very plain and basic in design. Traditional ceiling fans usually look exactly as we except a ceiling fan to look. Some may have filigree accents reminiscent of earlier designs, but for the most part these fans are very simple and suitable for all most decors. Note: Many companies also include ornate/Victorian reproductions in the "Traditional" category as many of the earliest ceiling fans were cast brass scrolling. These fans are indeed traditional but are also very distinctive in design, and are more decor-specific. This is a term used to categorize fans that are of a more modern design that are yet simple and versatile among a variety of decors. They do not look drastically different from traditional ceiling fans but may be more streamlined, more angular, or composed of materials of a more current style. These are fans of a very modern design, often resembling a propellor. 3 blades are common, rounded streamlined motors, integrated light panels, common in metal finishes such as stainless steel. 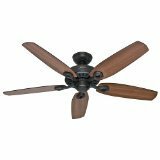 Often the blades are a painted or metallic finish as opposed to wood, giving the fan a 'monochromatic' appearance. Lastly, many companies offer commercial and industrial ceiling fans. These fans are not designed to have any aesthetic value, they are simply functional. However because of their inherent design they are similar in appearance to some contemporary fans and can be used as such when safely installed.